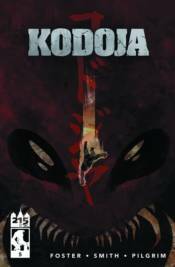 The first arc of Kodoja reaches its action-packed conclusion! The battle between Kodoja and the Serpent reaches its conclusion in Port Emerald at the base of Terror Mountain! Amidst the fury of the Giant Monster fight, General Cruz continues her dangerous mission in the field to stop Kodoja and end the rampage� while the mystery around the Secretary of Defense's suicide earlier in the day continues to unravel.